It's hard to find crackers that are't loaded with unwholesome ingredients or processed grains. These flat-bread crackers are easy to make and provide a great base for spreads or on the side with soup. And, they have only TWO ingredients! Preheat oven to 400 degrees. Put the flour into a large bowl. Slowly add water and mix with your hands until the flour and water becomes a dough (it should not stick to your hands, but shouldn't be too dry either). Move the dough ball to a wooded board and knead it for about 5 minutes. Divide it into 6 equal pieces. Then, roll each piece out as thin as possible (thinner than in my photo! 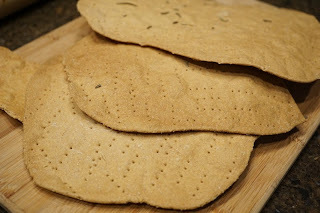 ), place on a parchment-lined baking sheet, and poke holes all over with a fork. Add salt and seasonings if you desire, lightly pressing them into the flat bread. Bake for 5 minutes on the baking sheet, then remove and stick the flat bread pieces directly onto the rack until lightly browned and crispy. DO NOT LET THEM BURN. When they are cool, you can break them up into smaller pieces.